I mentioned it briefly in a post last December that I'm moving out of my apartment to our new home and it is coming together but it's not quite ready yet. I still have a few things that I want to buy to make the house fully furnished and maybe . . . eventually . . . I will do like a home reveal or a home tour or something. But in the meantime, these few sneak peeks would have to do. Pic above is the living room which I dare say it's pretty much done. Oh wait, I do want to buy a side table to put in front of the standing lamp. Kinda like a charging station. We keep putting our phones on the sofa arm. Which remind me, I need to buy two more pillows so it's more cozy. 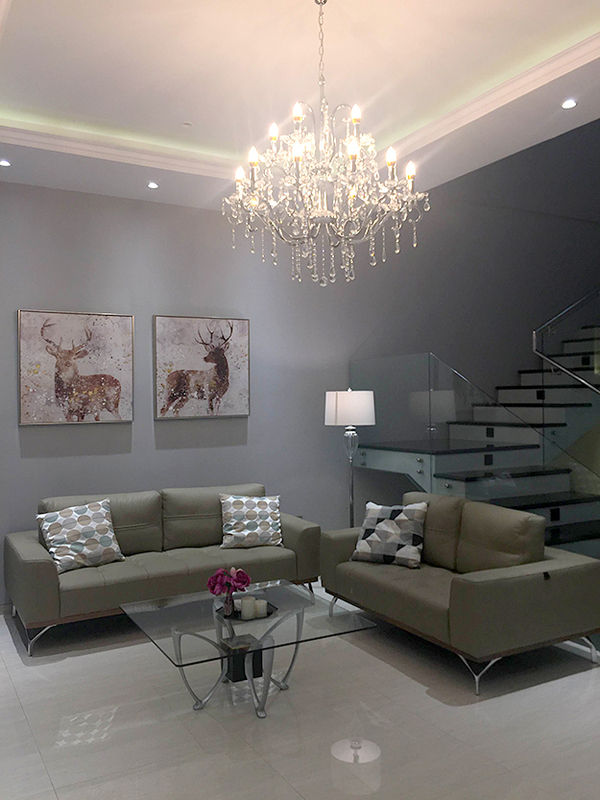 My favourite part about our living room, right after those deer paintings, is definitely the sofa! My dad actually bought the sofa as a housewarming gift and we couldn't be more thankful since they can be a bit pricey. Another favourite corner is definitely this custom made bookshelves. We struggled for while about what we're going to do with under the stair' space. We were pretty set to make it into a bar but then a fengshui revelation happened. You can see there are two doors behind this bookshelf and according to our relatives who still believe in fengshui (we, not so much) it's not good to have doors facing the front door directly. And then to my dad' suggestion, we decided to made a huge bookshelf so it can provide a little coverage to the room' doors. And I'm so happy we did. I can imagine this to be a reading corner. As soon as we have the money to buy a sofa and an ottoman. And maybe a cozy rug under it. As I mentioned before, couches and sofas can be expensive. It is good thing that there's website like lovecatalogues.co.uk where you can buy a sofa and just £5/ week. How crazy is that? 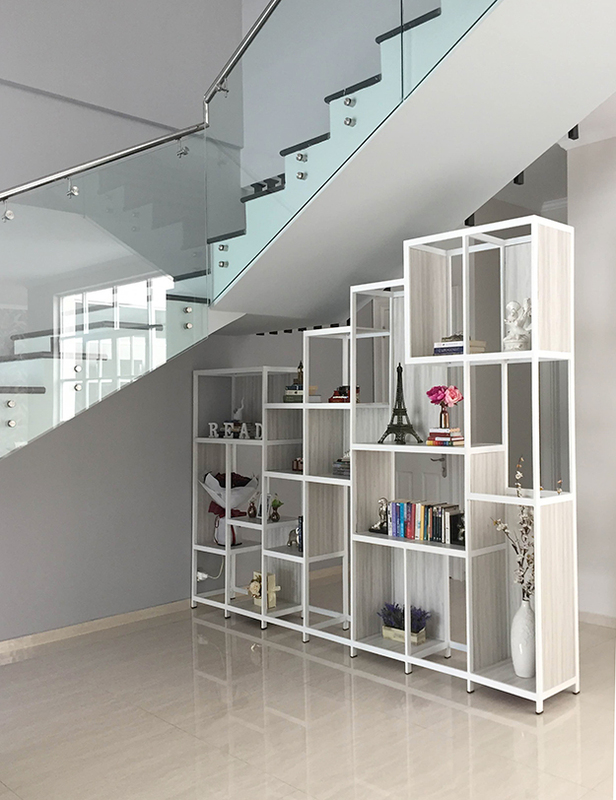 Not only furnitures, you can also find catalogues on clothing, electrical, and appliances. They provide "online credit card" in a simplified term; where you can pay instalments throughout one, two, or even three years. Some items doesn't even need a down payment. Which is pretty cool! Granted, of course there will be some hefty interest. 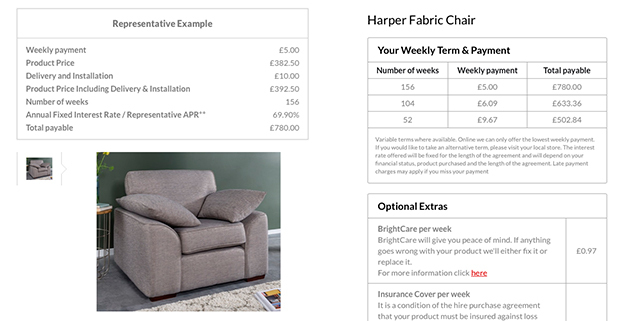 For example in this Harper Fabric Chair; which I thought would be perfect for my reading corner, the product price is £382 but if you pay weekly for three years, you'll end up paying £780. Almost twice the product price but instalment is still a good option to consider. Especially if you know you'll be using said item for a long time. Like furnitures. I'm not sure about laptops or TVs since there's always a new release of them. But for sofas, I think we're safe. I can imagine wearing my current sofas in living room until the next ten years.